A series of cold fronts tracked across southern Australia during the week, producing moderate falls, while a vigorous southwesterly airflow resulted in damaging winds and moderate falls in Tasmania, the Victorian Alps and Snowy Mountains in New South Wales. Past seven days: At the start of the week, a surface trough and weak low pressure system located offshore of southeast Queensland produced showers and light falls along the east coast from Newcastle in New South Wales to the Capricornia coast in Queensland. A series of cold fronts and troughs crossed southern Australia during the first half of the week, only clearing the southeast just before the end of the week. Moderate falls were recorded in southwest Western Australia early in the week, while an asscosiated cloudband extended light falls into the Gascoyne District and northwest and central Western Australia. Light falls in southern South Australia, southwest Victoria, and the Alpine region of Victoria and New South Wales became heavier as the period progressed, while western Tasmania received moderate falls throughout, and northern Tasmania around the middle of the week. Towards the end of the week, a surge of southwesterly air in the wake of the cold fronts brought further rainfall to parts of the southeast and damaging winds in parts of Tasmania, and some elevated or exposed parts of the southeastern mainland. 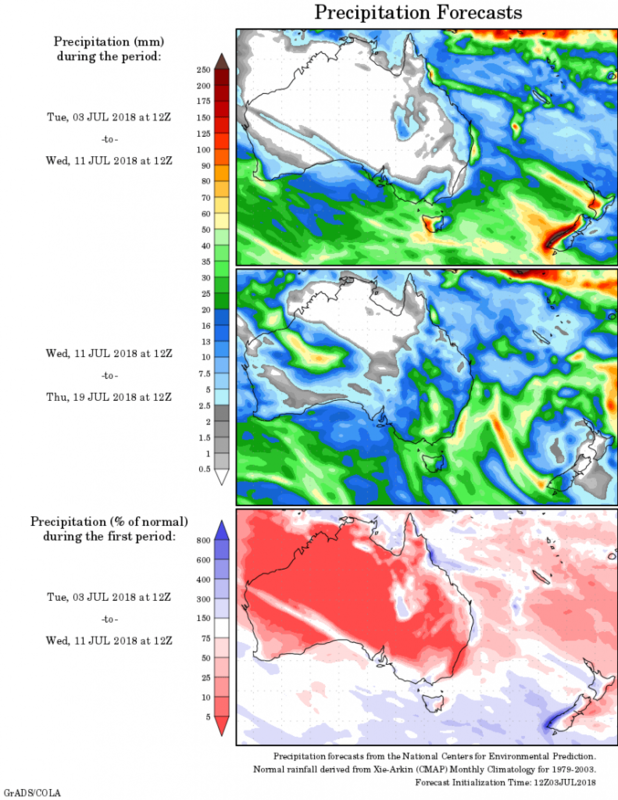 From the middle of the week, a surface trough extended along eastern Queensland and produced showers and drizzle with mostly light falls from central to southeast Queensland and adjacent inland districts, and across the border to inland northeastern New South Wales. Light to moderate falls were also reported in the north tropical and central coasts of Queensland. Rainfall totals in excess of 100 mm were recorded in western Tasmania, including the highest weekly total of 161 mm at Mount Read in western Tasmania. Rainfall totals between 50 mm and 100 mm were recorded in far southwest Western Australia, pockets of southern and northeastern Victoria, and the Snowy Mountains in southeastern New South Wales. Rainfall totals between 10 mm and 50 mm were recorded in Western Australia along the south coast, in the southwest and the Goldfields District; the Yorke and Lower Eyre Peninsulas, Kangaroo Island and southeastern South Australia; southwestern, southern central and northeastern Victoria; the Snowy Mountains and northeastern parts of New South Wales; most of eastern Tasmania; and in the north tropical coast, central and southeast coasts of Queensland as well as a small area of the southeastern interior of the State. Little or no rainfall was recorded in remaining parts of Western Australia; the Northern Territory; South Australia away from the coast; northwestern Victoria and most of Gippsland; most of New South Wales apart from the Snowy Mountains and northeast; and most of Queensland away from the east coast. *Mount Read was affected by snow and wind, and the true total is most likely higher.